Probably you’ve had to deal with a situation in which you forgot to save the file you have worked a long time. Maybe you chose the wrong button when a program asked you whether you want to save the file. Maybe it was a power failure or simply a system crash. There may be many possibilities, so in Excel 2010 Microsoft introduced the feature called AutoRecover. It works in a way that a document is automatically saved every few minutes. This operation is performed in the background, so you don’t even need to be aware of this. The copies of the file are automatically created. You can browse them later. The file that has been closed without saving is saved as a draft. Let’s suppose that you removed data, which later turned out to be important. You can’t go back by using the Undo (Ctrl + Z) button because you have exceeded the limit of 100 changes. In this situation, the best solution will be to return to the file that was automatically saved by Excel. You can do this by selecting FILE >> info. To the right of the Manage Versions button, you can find a list of files and information when these files were saved. If you select one of them, Excel will automatically open it in a new window. You can copy cells that you need or restore the file to the newest state with the button which is located above the working area of the document. 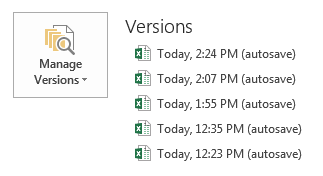 By default, Excel creates a backup file every 10 minutes. You can change this value in FILE >> Options >> Save >> Save workbooks. Here, you will find the position Save AutoRecover information every. Change the number to one that suits you. This number may be between 1 and 120.